While I’m not sure I’d want shelves like these in my own home, they certainly look very striking in this dramatic Toronto house. Oh gosh, that’s disturbing. The whole house looks interesting, where they’ve preserved many of the original Victorian architectural features and mixed in off-kilter elements. While it looks fabulous, I just know it would drive me crazy if I had to look at it every day, let alone find a book! Interesting for sure. I would want to sit, askance, and read Alice in Wonderland, or Willie Wonka and the Chocolate Factory. Interesting. Makes me dizzy though! 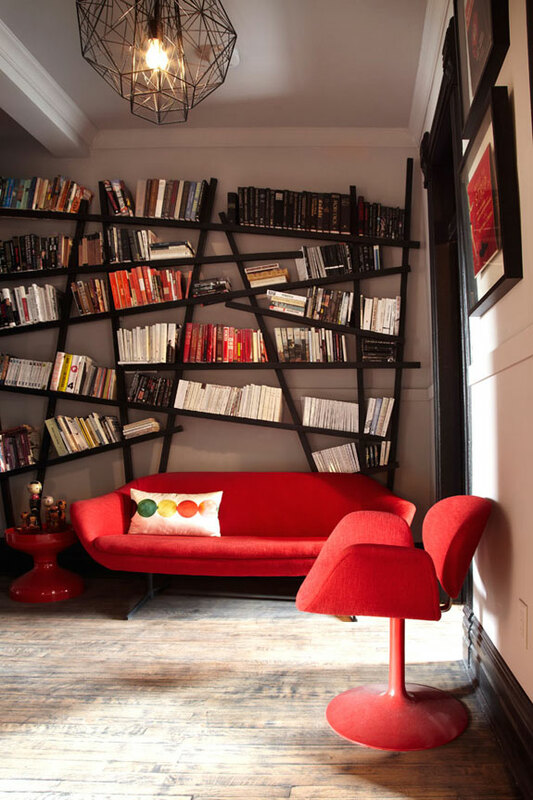 I love the look, but wouldn’t the books as the bottom of the slanty shelves get banged up? Wouldn’t the covers be damaged? It would make me dizzy! Don’t take this the wrong way but, to my taste, this must be one of the ugliest libraries you have featured in this long running feature. Perhaps a heavy drinking writer – and there have been a fair few of them over the years – might feel at home in this room, then again it might seem even worse through his or her eyes? I like the way it looks – I can see it working really well in a child’s or teen’s room. Being from Los Angeles, I find it reminds me of the results of an earthquake. Don’t think I could ever live with it, I would forever want to be making it straight! Cool to look at but definitely would not want them in my house! I’d love to visit that library, while I appreciate how fun it looks, I wouldn’t be able to make it mine.